No, that picture up top is not some kind of weirdo photochop. It's a real prototype F1 car, the last six-wheeler. Oddly, it set few a track records, though it never raced. The car is the Williams FW07D, described by Williams themselves in their 1982 season recap. It was a weird year for Williams, when their wheelman Keke Rosberg won the driver's championship with only one first place finish. Jonathan Palmer becomes test driver for what is a huge development season at Williams. It develops a four-wheel-drive, six-wheeled F1 car for 1983, but the technology is banned before the team has a chance to race it. Palmer still holds a speed record around Goodwood circuit in this car. As it turns out, this Williams did make a record-setting run at the Goodwood hillclimb when it was wheeled out of retirement in 1995, but it was just barely beaten later by Nick Heidfeld in a 1998 McLaren. Ok, that's cool, but what's this about being banned? ESPN explains. Team boss Patrick Head reportedly said the idea was dropped when "someone in a FOCA meeting said it would drive up costs and cause chaos during pitstops". The FIA banned four-wheel drive cars soon after and limited the number of wheels on a car to four. Hm. Pit stop chaos? That doesn't sound right. Maybe there's something more to this story. Let's go to the Internet's most rigorous motorsports history website 8W for more depth. In this exhaustive six-wheeled F1 retrospective, 8W makes the case that Williams felt they were in a very rough position going into the 1982 season, thinking their car was behind the times. The FW07 had been around since 1979 and while it was one of the great early ground effects cars, McLaren's new carbon-fiber MP4/1 looked like it was going to beat all the other naturally aspirated cars when the teams running turbos weren't outpowering them all anyway. Williams' genius head designer decided to try out a six-wheeled design to try and get some kind of advantage over his rivals. But why six wheels at all? As 8W explains, it wasn't so much about extra traction from another set of driven wheels, as other teams had tried in the past. It was all about an extremely cheat-ey interpretation of the rules regarding ground effects, the greatest source of downforce the sport had yet discovered. 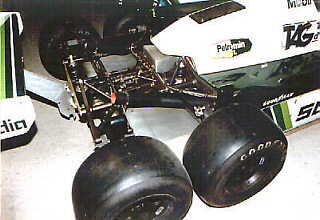 This six-wheel set-up would again be four smaller wheels at the back, in a direct effort to improve straightline speed and traction out of corners due to the increased rubber contact, but also to allow the free flow of air along the sidepods all the way to the rear axle of the car. As ground effects were permitted within the wheelbase of the car, Head cunningly interpreted this rule as being from front axle to, well, the most rearward axle! In Head's mind, these would be ground effects almost to perfection. The leading rear axle was placed four inches ahead of its original place, with the driveshafts angled to cope. Basically, to get more ground effects within the wheelbase, Head stuck an extra axle on the back to get more room! At that point, the added four-wheel drive seems like a free bonus more than a main goal. 8W explained that the 4WD system didn't have any differential between the driven axles. It worked by fitting an additional final drive to the back of the Hewland transmission to power the most rearward axle. Now, in a recent interview covered by F1Fanatic, Patrick Head stated that the car's "traction out of slow corners was phenomenal," that it never fell to understeer, and that drivers couldn't even tell there was an extra set of wheels at the back. However, there was one major problem with the car: that it was "bloody heavy." In spite of its weight and complexity, the six-wheeled Williams was surprisingly fast. It set a track record at Paul Ricard, beating Alain Prost's winter testing time in a turbo Renault. 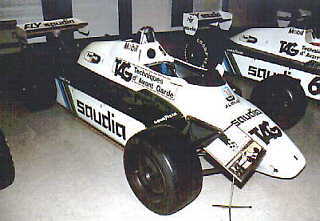 Williams continued to develop the car into 1982, expecting little out of their washed-up new driver Keke Rosberg and their out-of-date old chassis. But remember what I said about the 1982 season? It turned out to be one of the most utterly insane years in F1 history, and while Williams cranked away some decent but not amazing finishes, all the other teams around them sort of self-destructed. Favorites for the title McLaren completely fell apart and Rosberg managed to grab the driver's title with only a single win. Here's how 8W describes Williams and the FIA's changing attitudes towards the six-wheeled prototype as the year unfolded. Obviously unaware of the final Championship result, the Williams team then pressed on with its six-wheeler project and during the summer of 1982 a new car surfaced. This time an adapted FW08-01, codenamed FW08D, hit the Donington Park track. Its four-wheel driven times were stunning. In fact, they were so good that the FIA issued their 1983 regulations including a clause that outlawed six-wheelers and four-wheel drive. Williams' efforts had come to nought. And with Keke suddenly picking up one useful placing after the other – outpacing the unreliable McLarens in the process – and taking his debut win at Dijon, the Didcot team stopped having reasons for arguing too strongly with the FIA. And they had their negotiations with Honda going on anyway. In the end, Williams built a possibly world-beating 4WD, six-wheeled car, but they just didn't need it and the FIA didn't want it. Crazy to think of what could have been, no?